I’ve been out in a real blow once so far this season and fortunately the session turned from a hairy scary to hairy exciting and I found the boat hard work but manageable, and that was with the competition main up. I was hanging off the back few inches of deck that day and the boat absolutely flies, the kind of thing that puts a grin on your face for a week. The kite wasn’t used on that occasion but I’ll get it up next time in a blow. Other Vareo and RS 400 sailors tell me that the boat is more stable with the kite up in a blow as the wind grips it. That feels counter intuitive but I’ll try it next time. Also, I feel the need for (more) speed. 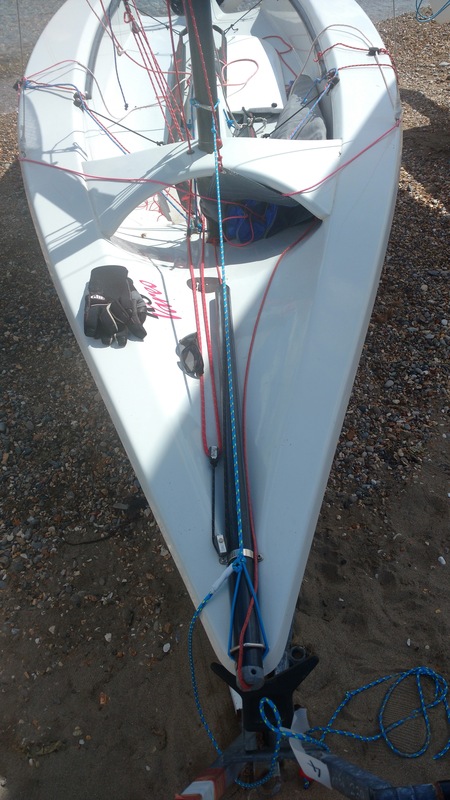 The kite is pretty easy to handle, though hoisting when stood up as the instruction PDF suggests only really works for very light conditions, I find it better to sit and hoist holding the tiller extension, as with pulling the mainsheet. Regards spinnaker usage, getting the angles right will take a while, but control is getting there. There’s no rocket science here, I’m looking out for gusts all the time and bearing away and and heading up in the lulls. My boat which was second hand came a 1cm mainsheet, I bought 8mm and 6mm mainsheet lengths, tried both and now only use the 6mm sheet. It makes the main way more responsive both in high and light winds. I use Gill all season gloves and that seems to work for my hands. One mistake was choosing a mainsheet similar in colour to the spinnaker halyard which makes them easy to mix up. I don’t use a clew strop rather some string with parrel beads which makes outhaul adjustments better. I think I read somewhere that this is has been acccepted by the class but should check. Capsizes are becoming infrequent but they are easy to handle even with the kite up. The last time was rolling the boat over whilst lying over the front paddling it back to shore in no wind, doh! The trick here, even with the kite up is go for a dry capsize and once standing on the daggerboard release the spinnaker, pull if half in and then right the boat. If you do find yourself capsizing, as the boat goes over try and release the kicker and spinnaker and step over onto the daggerboard. I bought and have tried a mast float once but found it to cause a lot of weather helm and haven’t used or needed it since. Make sure the daggerboard is tensioned with shockcord, otherwise it can fall out if the boat capsizes and inverts. It it does that, you’re in trouble something which has has happened to me once, but fortunately a safety boat was around to help. Thanks to its higher speed and therefore less pressure on the rig, gybing is easy and even in higher winds not a big deal. I’ll caveat that by saying that I haven’t yet gybed with the spinnaker in a blow, I’ll update when I more have experience with that. The handicap at 1085 seems high and I put that down to handicap races with race courses ‘around the cans’ not suited to the boat and probably a bunch of good sailors having switched to the RS 100 or another class. Sailing in a mixed fleet, I’m not complaining about the handicap :). The sail controls work fine and spinnaker and mainsheet controls are surprisingly easy to handle together and the boat is also quick and easy to rig. The boat’s all up sailing weight is 93kg, and whilst pulling it up the slipway single handed is fine, pulling it up a sloping beach needs two and at times I find myself wishing for a lighter launch trolley. Vareos don’t have forestays and there isn’t anywhere to attach a painter so I fashioned a something that does the job. It’s a length of thin rope with a shockcord loop which goes over the bowsprit. I stuff it into the main halyard stuff bag when on the water. Works nicely. With six Vareos at the Swanage Sailing Club I’m glad I bought a Vareo and it’s certainly more fun sailing against boats of the same class even if within a mixed handicap fleet. All in all a very enjoyable boat and I find myself looking forward to more exciting and challenging conditions. Thanks a lot for the posts about the vareo. Great to see that this boat is still sailed with what appears to be plenty enjoyment. I am currently looking for a boat for River sailing and the Vareo ticks a lot of my boxes. Could you tell me the true mastheight. We have some bridges here the lasers and finns can get through and I am looking for an alternative to those two boats. Hi Klaus, interesting post, can I ask where you attach the other end other painter? Is it secured around the mast bridge? Hi CM, good question. I’ve added another image showing how it’s tied to the mast, it’s very simple with just a clip. Idea being to be able to remove it quickly or reattach when I come back to shore. Thanks for your blog Klaus. I tried to rig my spinnaker for the first time today. Think I finally sorted it but by then the wind had died. I do not understand how you have fitted the painter. You say there is another picture but I could not find it. Could you email me a copy please when you have time. Thanks again for the article I enjoyed reading it. Hi Peter, those are the only pictures I have currently. Perhaps this higher resolution image helps: https://klausharris.files.wordpress.com/2017/06/img_20170604_102053214.jpg . It’s basically just a line with a loop of shock cord attached.